Meal prepping is a great way to ensure that when things get busy you still have a way to quickly put together a nutritious meal for yourself and your family. The following are key components: 1. pick a day of the week when you know you have some time and stick to that day (usually weekends work best) 2. Plan what you are going to do ahead of time, check your pantry, and create a grocery list. The tips below will help you stick with meal prepping even when time is short. 1. You don’t have to prepare every meal or every item of every meal. While some meal preppers prepare every meal placing them in fancy Tupperware in ways that look more like art then food, there are other ways to meal prep that are more conducive to a family. Think about meals as needing each of the following components, whole grains, lean proteins, healthy fats and vegetables or fruit. If you know you have time to make breakfast every morning then don’t take the time to prepare it, if you struggle with dinner prepare foods that can be used in different dishes to keep the variety high, or prepare meals you can easily throw into your crockpot or instant pot. An example of a quick prep include cooking a large batch of chicken on Sunday and eating it throughout the week as chicken tacos, chicken soup, chicken with rice and vegetables etc. If you struggle adding fruits and vegetables into your day prep them before hand, roast large quantities of vegetables or makes soups that are veggie rich and will last for the whole week. Wash fruit or prepare smoothie bags for a quick satisfying breakfast. 2. Make a choice to make it a habit. Add meal prepping to your schedule and take the time to decide what items of meals you want to prep before time and check your pantry and fridge before going to the store. Meal prepping can be a great way to save money too because you won’t be caught off guard hungry and end up spending more on ready prepared food. Meal prepping is meant to save time not create added stress. If you find that the food you prepared for dinner doesn’t sound good you have the ability to switch it up. If you spontaneously decide its pizza night then use the salmon and brussel sprouts that were planned for dinner another time. 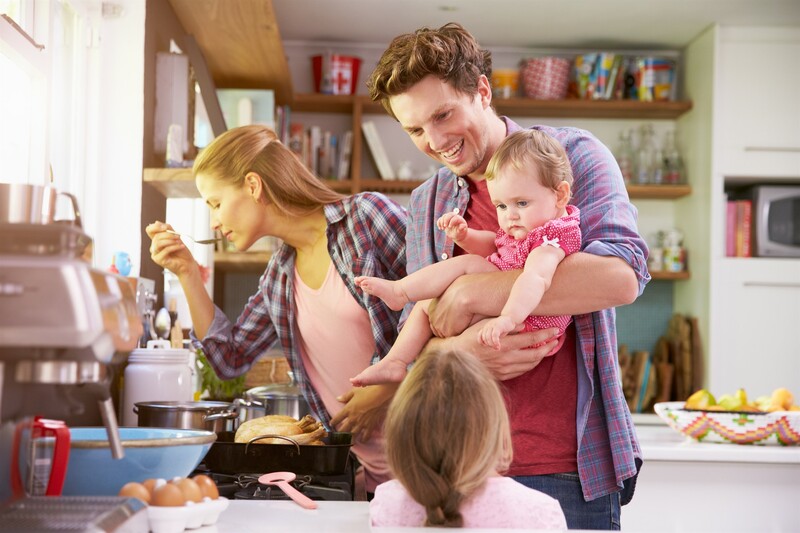 Allowing for some help from little hands can also be a fun way to get the whole family involved in cooking even if it’s only once a week. Meal prepping is a great resolution to create healthy habits for the whole family. The key to good meal prepping is assembling a variety of foods instead of meals, making a habit out of the process and allowing for some flexibility. Who knows it could become a cherished family tradition? Visit ChooseMyPlate.gov for additional tips on creating healthy meals for your family including recipes, shopping on a budget, and more.